I revel in the grand celebration taking off today in the virtual space. Together with many excited and joyous bloggers I have taken the plunge to blog all through April (well almost, 26 days that is) for the A to Z challenge! I've never done a month long challenge before and often have found, even blogging an entire week strenuous. But what's the fun in staying in your cocoon and comfortably navigating through known waters, right? With A to Z, I am looking forward not only to better my writing skills and become a more sincere and regular blogger; but also to make new, enriching and wholesome connections with bloggers all over the world. This year a whooping 1400 bloggers have already signed up for the challenge!! Goodness, imagine the kind of time and meticulous planning that would go into networking with all these bloggers! And that it is why all the veterans of the A to Z challenge say one thing, 'Plan and schedule your posts in advance". Following their sage advise we are today doing a Theme Reveal post hosted by our very dear and charming Vidya Sury. Frankly, I am not a planner. I am really bad at scheduling and even if I mark my calendars they tend to show a red cross instead of a green tick. So my initial reaction to the theme reveal was no reveal. I thought I'll go with the flow, brave the scorching sun, the thunder storms, the chilly winds as and when they hit me! But I am so glad I didn't act my usual self! Yes I have a theme and it'll be fiction all the way. I plan to write 26 pieces of short stories/ flash fiction revolving around the theme 'Shades of Life'. Right now I have no post up but I do know my A,B,Cs - every day I'll pick up a colour corresponding with the day's alphabet and use it as my prompt to churn out a story! I still have time for scheduling my posts and so do you! 10 days to go!! So whatever comes in your mind, just write it down and turn into a post and join us in this month long fiesta!! Hopping over to some other amazing blog participants of A to Z. You can blog hop too here! Cool...shades of life! Considering my love for colors I would be looking forward to what you eventually churn out. Good luck! good luck with that! i know one blogger who has done it a couple of times. 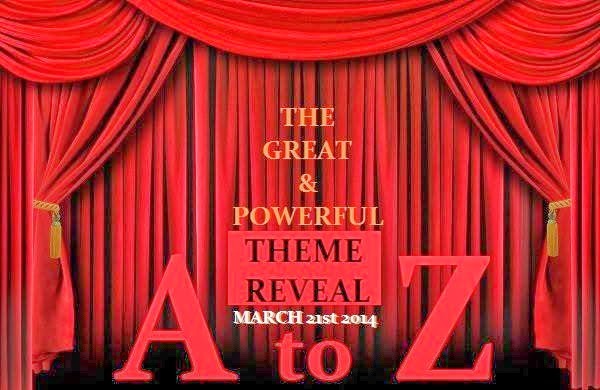 she picked a 'theme' to follow and came up with a-z words to expound on her theme. either way, it takes diligence. Lovely! 26 short fiction stories! Will be reading your blog for sure. Bring it on girl! Very cool! Loving the theme and looking forward to reading your stories. It's hard to plan and schedule though, isn't it? But I'm sure it'll be less stressful that way! Thanks Shiva :) I'll try and keep it chotu! Thanks Sunila :) we sure will have a blast throughout April! Thanks Ananya :) looking forward to doing the challenge with all u guys! wow!! Short stories! looking forward to read them all! You are on my bloglovin and reading 26 super stories on life - nothing better! I might not get away from this page at all. Life is a popular topic. Look forward to your 26 shades. Just go with the flow Sulekh! Knowing you I know you'll come up with something bright and beautiful each day! I love fiction! Waiting to read your stories Aditi! Hopefully I can complete my posts staying within my chosen theme. Good Luck! Thanks Archana :) I love your theme and all of us are sure to learn something from your posts! All the best! Oh gosh, that's a big task to write so many short stories and not yet have them scheduled! I did something similar last year and was fretting over the last six at this stage. :) But you are probably better organised than I am, on a day to day basis! Quiet Laughter: The Mighty Theme Reveal earlier and for the super sweet comment you left--much appreciated :) I look forward to staying in touch! Looking forward to reading your posts on the shades off life! Good luck with all the flash fic, I'm dying to know which colours you have picked. I'm doing flash fic as part of my posts this year too and I'm up the L so far. I hope you have fun writing yours. Thanks a lot Tasha :) and high five for fiction! Yay! I like the idea of the colors and your theme! I have all of my post titles chosen but have not written one...yet. I am hoping to get a few done this weekend. Thanks Eli!! You participating? Please do...there is still time! Great idea for a theme. Last year I had most of my posts scheduled but this year it's a mess. I'm sure you'll rock it! Thanks :) looking forward doing this challenge together! I'm sure your treasure chest will provide some great writing prompts for your stories. I'll bet they'll be really fun to read. Sounds interesting. I shall look forward to reading your stories. I'm sure you'll get around to writing fiction soon! You rock that area girl! Love the quote -- so true. Thanks Ida :) Wow would love to have your inputs on the colours then! I LOVE flash fiction and I LOVE the sound of your theme! During the 2012 AtoZ challenge I posted 26 musically-inspired flash fiction pieces, which I'm going to publish later this year! And yes, you should plan and schedule your posts in advance. It definitely helps. This is my 4th challenge... so I know what it's all about. Wow musically inspired fiction...would love to read them! I'll have a lot to learn from you! I like flash fiction and shades of life sounds like a great theme. Aditi this should have been my blog's theme. Looking forward to stories. 26 Shades of Life...this I gotta know! Very good theme, Aditi. All the best! You are so brave to tackle a short story every day. My theme is wimpy compared to yours. :-) I'm glad I joined your site--I'm looking forward to reading your stories. And thanks for commenting on my blog, too. This sounds like an amazing theme! Can't wait to read your stories! Thanks for stopping by my blog--it's great to find others with similar beliefs. Love the quote by President Hinckley. Thanks Kristin...discovering fellow bloggers...isn't that the beauty of AtoZ! Would love to know how you get your inspiration for your stories. I will be checking back during the A to Z challenge to see how you're doing and to read your stories. This is my third year participating and the first year I wrote from the hip without any planning, the second year I gathered words to choose from on the specific days, and this year I am planning out what I want to write for each day. We shall see how it works out, I'm not usually much of a planner. Here is to both of us accomplishing our goals! ah...flash fiction..! I look forward to reading your posts! I think it's awesome that you decided on a theme, yet one that gives you flexibility! Good choice. Welcome to the A-Z. I wish you all the best! Thanks Amrit! See you around! What a fun idea!! Can't wait to see what you come up with! that's a lovely theme!! i'm so looking forward to read your posts!! '26 Shades of Life' sounds like a great theme! Looking forward to reading your A-Z posts.